Abilene Basketball Teams Sweep at Marysville! 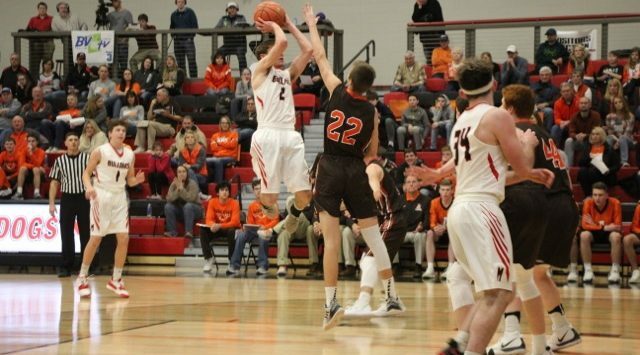 The Abilene High School basketball teams swept Marysville Friday night with a pair of road victories to remain in first place in both the girls and boys NCKL standings. The Cowgirls completed the season sweep of Marysville with a 58-46 victory, while the Cowboys avenged their only league loss of the season with a 63-47 win over the Bulldogs. The Cowgirls got off to a fast start for the second consecutive game Friday night. They led 19-8 at the end of the first quarter, extended the lead to 33-19 at halftime and would lead 47-34 as the two teams entered the 4th quarter. In the final quarter, the Cowgirls got up by as many as 22 points. Abilene got a breakout performance from Junior, Beth Holmes. She finished with a career high 17 points and hit 4 of 5 three point attempts. She had struggled at the foul line this season but connected on 5 of 6 attempts Friday night. The Cowgirls also got a season high 23 points from Senior, Sydney Burton. The 5’8” guard also pulled down 11 rebounds in the victory. The Cowgirls improved to 12-2 on the season and 7-0 in the NCKL. Marysville slipped to 8-7 and 4-3 with the loss. In the second game of the night, the Cowboys erased memories of their January 4th, 39-38 home loss to Marysville, with a 16 point victory over the Bulldogs. The game was tight early and appeared to possibly resemble the Cowboy’s previous two trips to Marysville. The two teams had played to overtime in the previous two meetings in Marysville, with Abilene winning last season and the Bulldogs winning two years ago. Abilene led 15-12 at the end of the first quarter but Marysville’s Dalton Denner, would bury a three-pointer to tie the game at 15 on the first points of the second quarter. The Cowboys would then counter with an 11-0 run and never looked back. Freshman, Kaleb Becker capped the run with a bucket to make it 26-17 with 4:17 to play in the half. Abilene would lead 31-23 at the break and 49-32 at the end of the third quarter. The Cowboys would lead by as many as 19 in the final quarter. Abilene was led by Becker with 15 points, they also got double figures from Seniors, Tim Barbierri 14 and Preston Boyd 11. The Cowboys improved to 11-3 and 6-1 with the victory. It was the fifth straight win for Abilene. Marysville fell to 9-6 and 5-2 with the loss. Abilene will host Council Grove Tuesday. The Braves were swept by Clay Center Friday night. The Clay Center girls won 44-38, while their boys hung on for a 51-50 victory.